Oh man - I'm actually so tired from my break in Singapore! It's funny: He kept teasing me by asking me to chew my food faster! 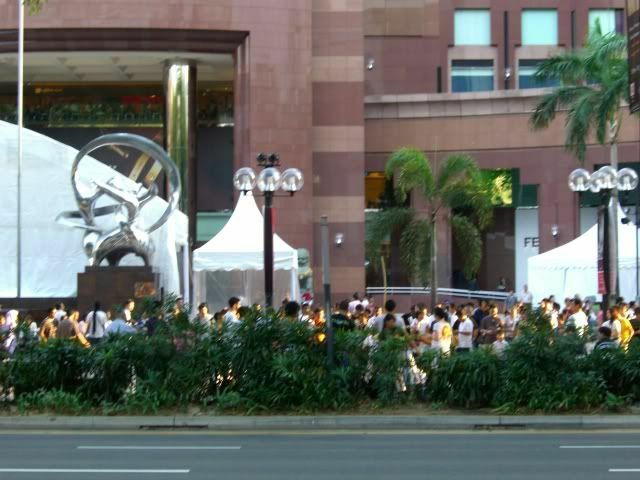 1) The national past time in Singapore seems to be hanging around Orchard Road. 2) Singaporeans love designer brands. It seemed like every other girl was carrying a designer bag - anything from Guess (which is already not that cheap) to the newest Burberry (which I love but costs almost 3,000 Singapore Dollars) to the newest Fendi (which costs EVEN more - almost 6,000 Singapore Dollars!). There were even loooong lines outside some stores (like Coach and Gucci) that were having some discounts to clear off their Spring/ Summer collections. 3) Wah, (some) Singaporean girls wear very skimpy clothing! I'm pretty open minded but some of these girls walking around Orchard Road (in broad daylight) had very little cloth on their bodies... bare back halter tops, really mini skirts, etc... They kinda looked like they planned to go clubbing straight after they finished lunch. Well, who am I to judge them anyway? If they are comfortable enough with their bodies to bare so much skin, then it's really up to them. All in all, I had fun in Singapore. Will update more on the food there as soon as I can. You were there on Merv's birthday. You should have surprised him.. hehe.. Anyway, how much did I spend, you ask? In short, it wasn't very much but it was still a big chunk of my monthly pay. Well, I wish I had a lot of $$ too. Was it the big sale in Singapore edi?